I’m a HUGE fan of Aneela Hoey, her patterns and the way she can create such fun mini projects, most of which can be achieved in an evening. This time I wanted to make the All-In-One Box Pouch. 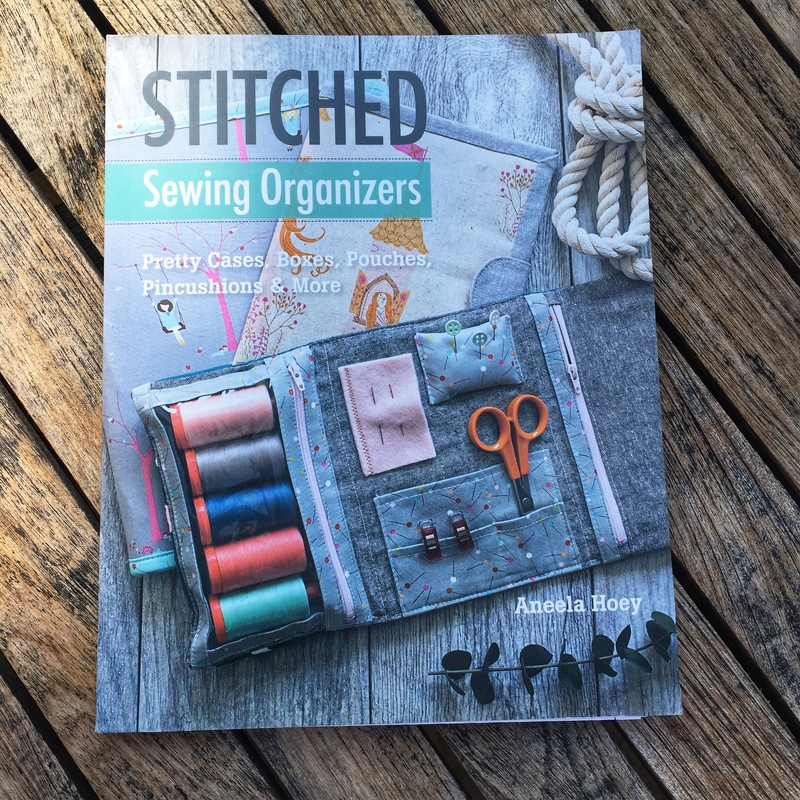 The standalone pattern has been recently updated, but a version of it can also be found in Aneela’s book – Stitched Sewing Organisers. I have to admit to having a tendency to be distracted by sparkly things and for a long time now I have been loving working with Robert Kauffman Metallic Essex Linen. I find that for these boxes, the added firmness of the linen fabric is really helpful and of course, like a child, I love the way it sparkles in the light! 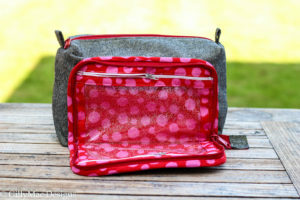 For this project, I have used Ebony Essex Linen with Gold Metallic Threads and twined it with Tula Pink’s Tabby Road Fur Ball Fabric in the Strawberry Fields colorway. I enjoy evenings making things much better when I have previously got myself all prepared. As well as fabric, for this project, you will also need fusible interfacing (I used light-medium Vilene F220/304), fusible fleece (I used Legacy Extra Lofty Fusible Fleece) and also clear vinyl (I used sparkly vinyl – obviously:-)). The day before I spent an hour cutting out, fusing on and ironing binding strips – all ready for my solo #saturdaynightcraftalong. The first thing to make is the front pouch. 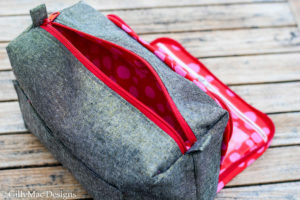 I hadn’t made a pouch like this previously – but having done it, I will certainly be adding it to the techniques I used most frequently. It is created by adding the binding and zips to the vinyl and then casing it in the lining and basting the external fabric on the reverse. 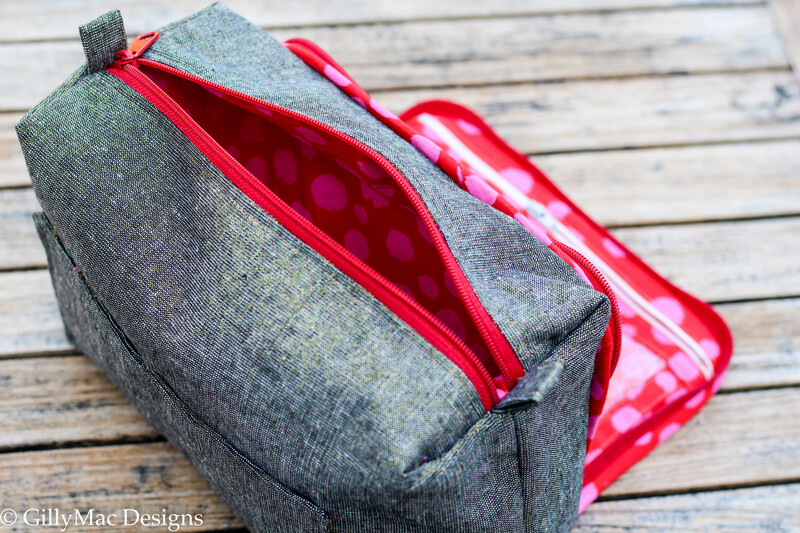 If that wasn’t clever enough, the 20″ zip is then sewn around the pouch … then the whole lot has binding applied all around the edges. 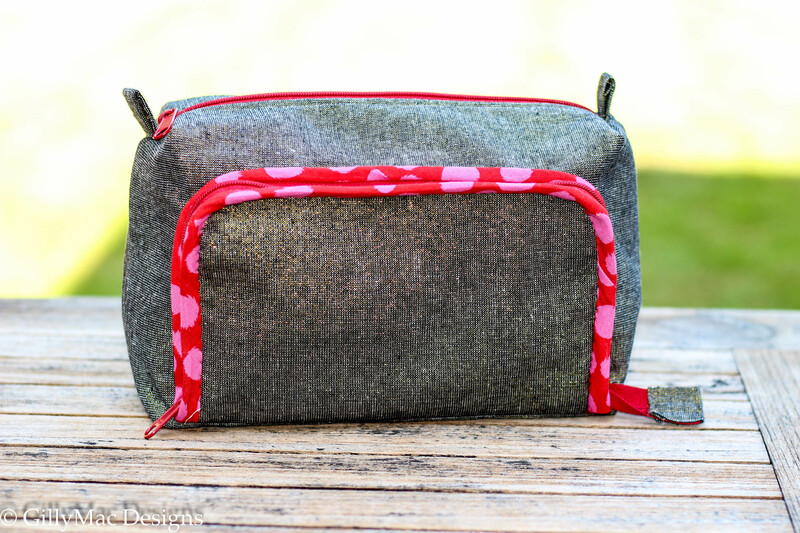 I’ve missed out a few steps, as Aneela’s Pattern is her own, but believe me it is super clever and not hard when you take it step-by-step! After the fervor of making the front pouch it was time for tea and cake and a little hand sewing to finish the binding off. Then I was off again !!!….. 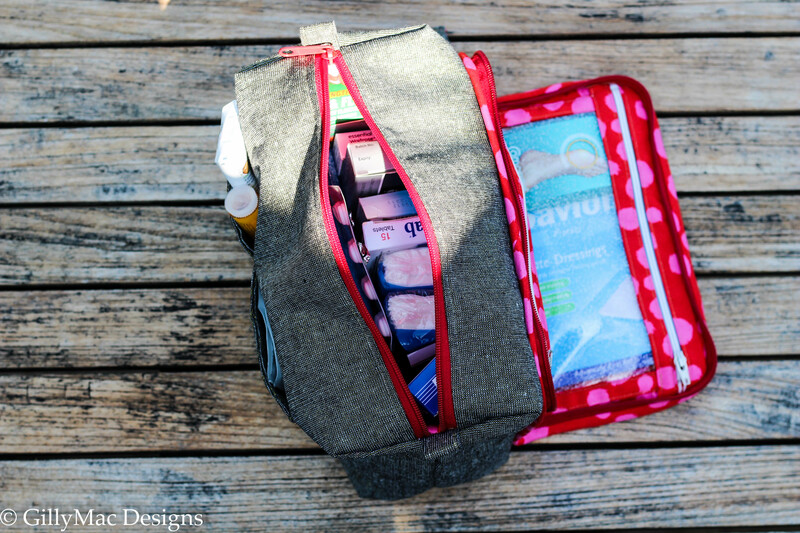 making the back pocket and then adding it and the front pouch to the exterior pieces of the main pouch. 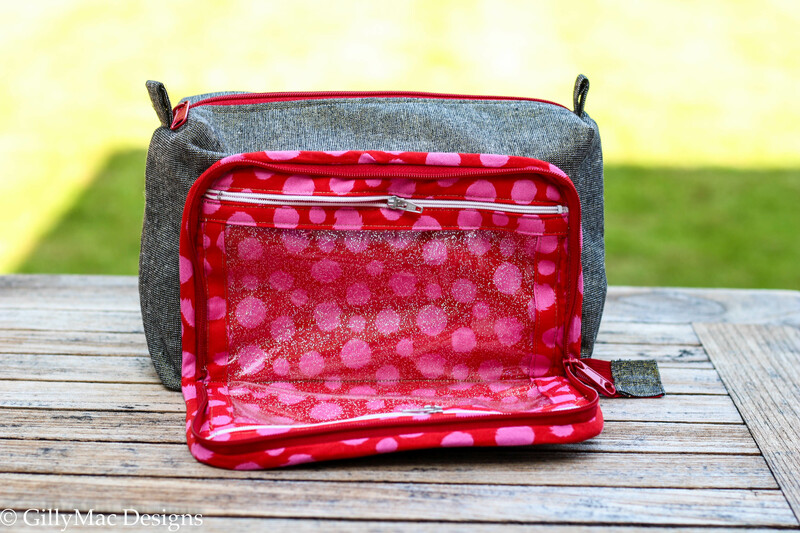 The pouch is then sewn together and suddenly you are finished. WHEW ! All in all (without cutting out). It took me 2 1/2 hours to make this – so 3 1/2 hours with cutting and fusing. The important points to highlight about the pattern is that however experienced you are, read it properly and follow it closely. Don’t skip the kick -off steps making up the tabs, adjusting the top of the long zipper or marking up the material as directed. These are all vital to your success. 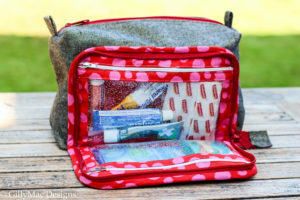 My bag is now filled with my traveling medicine cabinet. 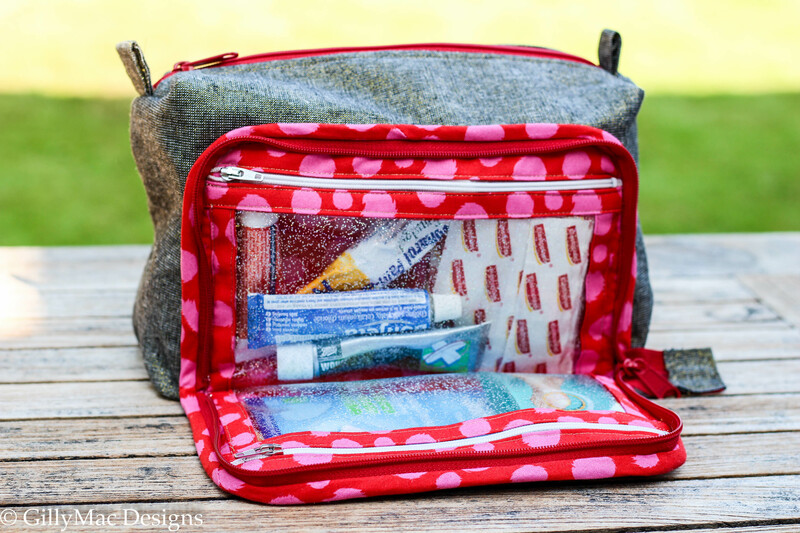 You can get a lot of stuff in this pouch! I so loved making this, I have already cut out the pieces for another one. Once again I am using the Metallic Essex Linen (this time Navy with Silver Metallic threads) but for the lining, I am going to use a Cotton & Steel/Rifle Paper Co. fabric range called Amalfi. 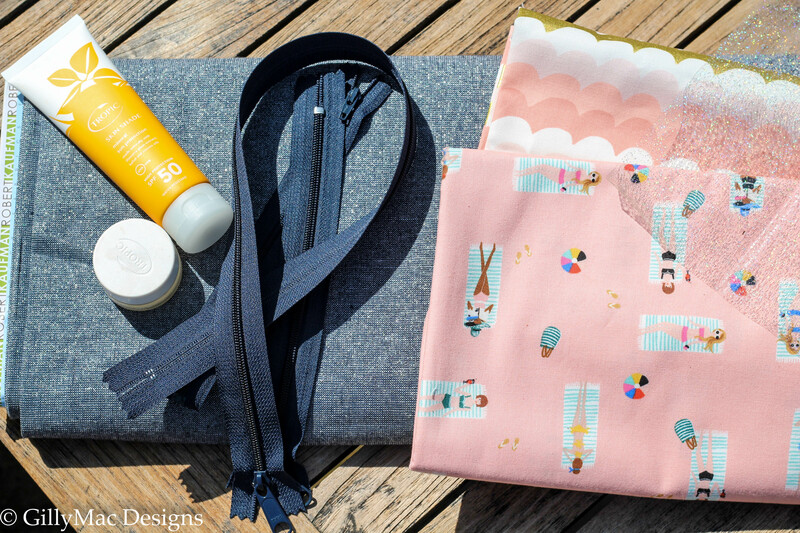 I like the combination of the Sun Girls and Waves fabrics, both in Coral. 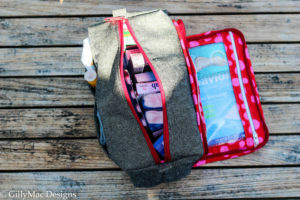 I thought I would use the Waves fabric for all the binding and the Sun Girls for the linings of both the front and main pouches. I think this combination will be perfect for my older daughter on the beach later on in the summer. 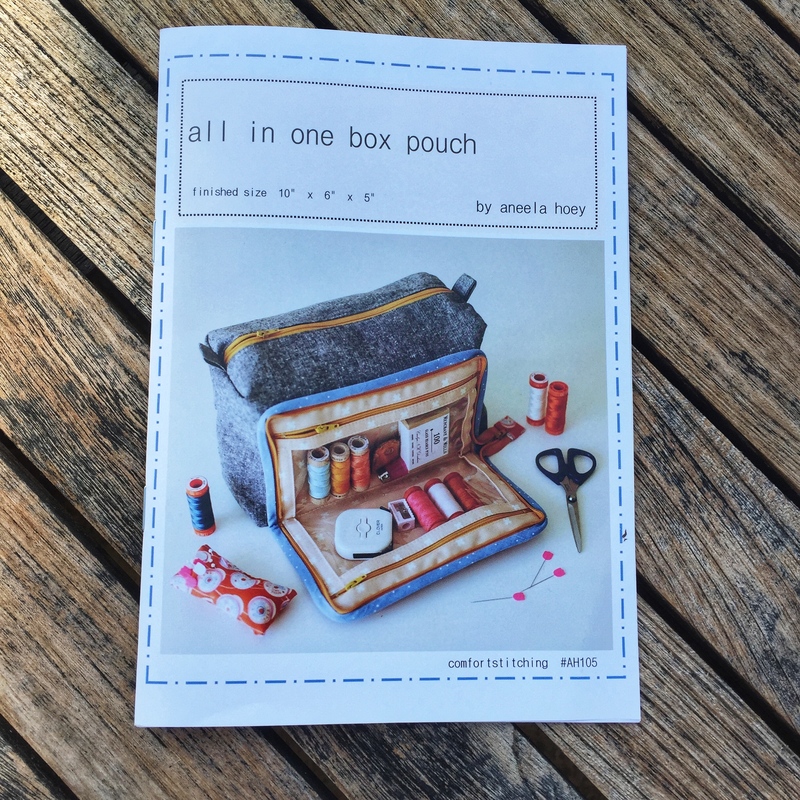 The next class with spaces on it to make the Aneela Hoey All-In-One Box Pouch is on 3rd July (7pm-10pm). Call Gill on 07818 551232 or email on mail@gillymacdesigns.com to book a space. More information about Aneela and her patterns can be found here.